A fathers' rights campaigner who climbed the London Eye dressed as Spiderman has been found not guilty of causing a public nuisance. 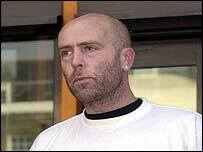 David Chick, 37, from Burgess Hill, West Sussex, told the Inner London Crown Court it was "a peaceful political protest". He said he spent 18 hours on top of the tourist attraction because he had not seen his daughter for 18 months. Mr Chick climbed the 450ft-high attraction on 11 September last year. The jury were told he had also unfurled a 15ft long banner reading: "In The Name Of The Children." The prosecution said on Monday that between 15,000 and 20,000 people had had their visit to the attraction ruined after police closed it down during Mr Chick's protest. He was arrested as soon as he climbed down from the structure. Mr Chick told police, in a statement written before his protest, that his demonstration was in accordance with his rights under the Human Rights Act. "I do not believe that the owners of the London Eye, or any members of the public, would regard this act as a nuisance," Mr Chick wrote.